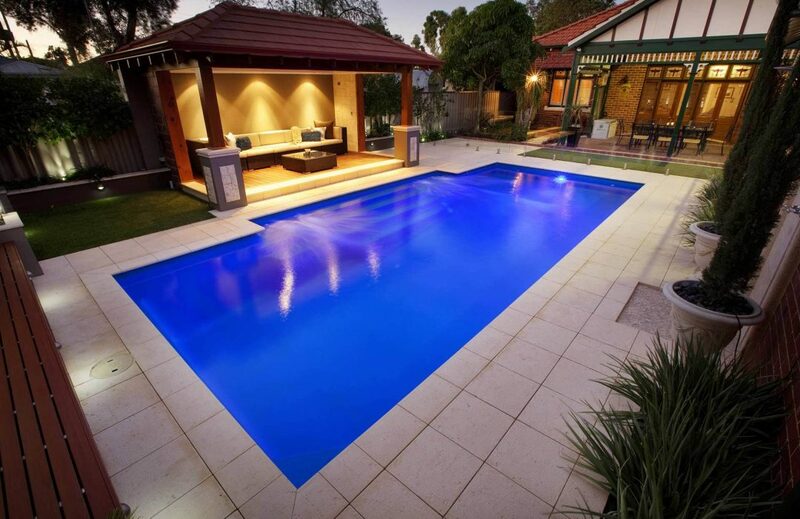 We are in a league of our own when it comes to our wide range of fibreglass pools Adelaide. Synergy is a dealer of Australia’s leading Aqua Technics line of swimming pools. This means our clients can have complete confidence in knowing that their pool is engineered to a strength up to 20% greater than its competitors. Our fibreglass pools Adelaide are fitted with a smooth surface and finished with Anti-Microbial technology. This works to reduce the growth potential of algae, and minimise pool maintenance. Our fibreglass pools Adelaide are also covered by our Colour Guard Lifetime Interior Surface Guarantee. This means you can have confidence that your pool will never fade or become discoloured. Synergy’s fibreglass pools Adelaide are available in a range of stylish and modern geometric designs, and many colours and sizes, so you can choose one to suit your exact tastes and environment! Synergy’s holistic approach ensures our fibreglass pools Adelaide are designed and installed to the highest possible standard. Our end-to-end service begins with designing your pool based on selections before council approval is sought and site preparation commences! Once we have cleared the site of shrubs and pavers, we will begin the process of excavation. During this process, we will be sure to remove all excess soil from the yard as we go. Our fibreglass pools arrive with lights and half of the required plumbing pre-installed before it is positioned by a crane. When we are satisfied with its location, we can begin with constructing the concrete edging and coping; after which the filtration system will be activated! The entire process will take between 2 and 4 weeks to complete. Beyond this, we will still be available to happily answer any questions regarding care and maintenance. Our fibreglass pools Adelaide are kind to the environment, dispersing less VOC emissions than traditional gel coats. This coupled with our leading edge filtration equipment offers low operating costs and a long lifespan. We trust the quality of our fibreglass pools so much that we offer an industry leading Extended Lifetime Structural Warranty, surpassing the requirements outlined by the Swimming Pool & Spa Association (SPASA). In addition to the design and installation of fibreglass pools Adelaide, we also offer pool renovations and repairs for fibreglass and concrete pools. If your existing pool is in good condition but just requires a bit of TLC to transform it back to its former glory, we can perform a comprehensive renovation to have it looking better than new! If your pool is leaking or system is malfunctioning, our trained technicians will complete repairs to the absolute highest standard to promote system longevity and efficiency. Synergy Pool and Spa are leaders in the design, installation and maintenance of fibreglass pools Adelaide. Call the friendly family team today to discuss your exciting pool or spa project!